Annuity rates for people in good health rise to the highest point for 2017 even though gilt yields remain level as competition from the leading providers increases before the end of the year. Standard annuity rates are higher by 0.81% for the month of November after a 0.39% rise the previous month even though gilt yields are down by 3 basis points. Providers offering annuities for people in good health such as Aviva, Legal & General and Canada Life are competing for business at the end of the year keeping rates high. Annuities are mainly based on the 15-year gilt yields and a 3 basis point fall would see annuity rates reduce by about 0.3%. However since May 2017 standard rates have out-performed yields and kept high by providers. In contrast smoker and enhanced annuities have reduced by -1.08% in November and -0.40% the previous month since yields peaked before the 0.25% rise in interest rates by the Bank of England. Our benchmark annuity example has reached a high for 2017 based on a 65 year old buying a single life, level annuity with a fund of £100,000. Rates are now 2.02% higher than the January level with gilt yields remain lower at -1.60%. The chart above shows how both annuities and yields have diverged from about May 2017 with rates remaining at or above the January figures. In contrast yields have remained below the start of the year and may not improve anytime soon as the Bank of England does not expect a further interest rate rises until August 2018. Current levels of standard annuity rates are high relative to gilt yields and our benchmark example has increased by 7.7% since April. 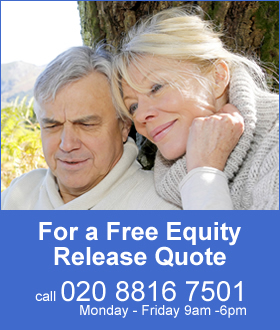 For a fund size of £100,000 a 65 year old could have received a level annuity income of £5,108 pa and this has increased by £395 pa to £5,503 pa in December 2017. In terms of lifetime income, the Office of National Statistics (ONS) would expect a male to live for 17.3 years and he will have £6,833 less over his lifetime. 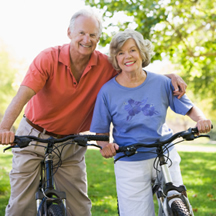 For a female she can expected to live for 20.4 years decreasing her lifetime income by £8,058. In the short term over two months the average of all standard rates has increased by 1.20% compared to enhanced annuities with a fall of -1.48% with the 15-year gilt yields lower by -0.40%. This suggests enhanced rates have room to increase by 1.08% whereas standard rates are likely to fall -1.60%. 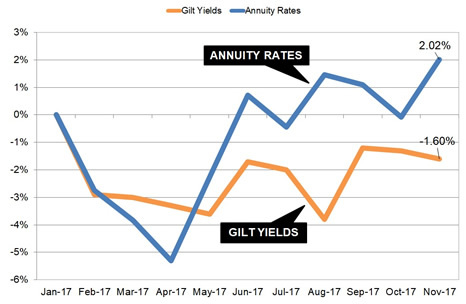 Any further decrease in gilt yields are likely to see standard annuity rates being reduced by providers in the new year.